On Mars, the Decepticons managed to hand the Autobots their head modules although Thundercracker gets a beatdown of his own. With the data transferred the Decepticons return to Cybertron. Starscream begins assuming his role as the new Decepticon leader and making Megatron’s old headquarters his. Then he gets an update on his little project, which appears to be a new All-Spark cube! Back on Earth, the humans are trying to decide what to do about the Autobots…and the All-Sparked vehicles from Mission City. But someone is watching them. What they got right: Arcee was supposed to be in the movie but at least she gets to shine here. Although she’s ultimately defeated she’s given a good character and a tie to Bumblebee and his fate being paralleled in Cliffjumper (which was during that period when Hasbro would release Bumblebee in red and call it Cliffjumper). I hope we see more of her…oh wait, we will. Not as much as I would like, mind you. She has a lot of potential as a character and I like her Cybertronian mode, reminiscent of the motorcycle form she would have had and her toy did have. What I really like is Starscream’s portrayal here. Like so many of the movie bots, there isn’t a lot of characterization. In this story we don’t get the usual coward who is sneaky but otherwise incompetent, Furman’s exaggeration of G1 cartoon Starscream that was only interesting in Transformers Prime. Here Starscream doesn’t so much serve Megatron as he does the Decepticon cause and is thinks Megatron abandoned and betrayed them due to his obsession with the All-Spark. Here he’s exploring another option. I give him an A for effort at least. What they got wrong: The Transformers wiki said it best although they were more neutral about it than my review: “The mass slaughter of toys who aren’t in the film, both here and later, come from Mowry’s feeling that a war story requires deaths and the movie cast are untouchable, and that some of the toy characters wouldn’t be missed if they’re bumped off. (Poor Crankcase gets singled out as an example of the latter)” For some reason every time Transformers goes to the big screen death comes way too easy and you give up decent characters. This has been true since the 1980s cartoon so I’m not singling out Mowry here. Recommendation: This is quite a good story and better than the direction the movies took in my opinion. Give it a read. 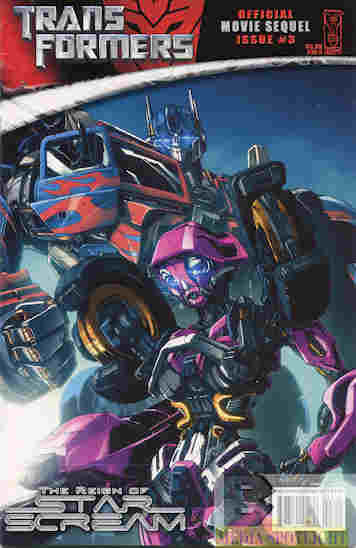 Posted by ShadowWing Tronix on December 13, 2018 in Movie Spotlight, Yesterday's Comics and tagged Arcee, IDW Publishing, Starscream, Transformers (film series).